We use our special Deck Armor Weather Protecting Sealing System to increase the lifespan of your deck by 10 years and make it look like new. 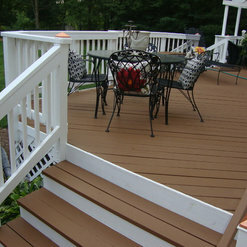 Deck resurfacing rather that deck replacement will save you time and money. 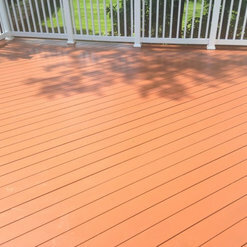 Deck Armor Weather Protecting Sealing System will be giving your existing deck increasing the value of your home, preparing it to be sold in the future; as well as adding charm and beauty. 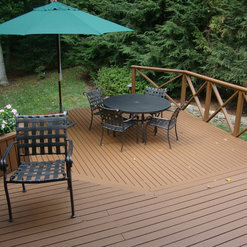 Our Deck Armor team Completely eliminate all splinters and all nails & Makes Your Deck Safe Again. This system Prevent cracking and warping makes Complete protection from weathering and rotting. Prevent mold and mildew. 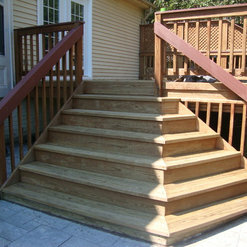 Increase the lifespan of your deck by 10 years!!! Smooth acrylic finish. Maintenance FREE. 3 YEAR OF CUSTOMER SERVICE! As a result, our technique: •Completely eliminate all splinters. •Eliminate all nails. •Prevent cracking and warping. •Complete protection from weathering and rotting. •Prevent mold and mildew. •Smooth acrylic finish. •Maintenance FREE. 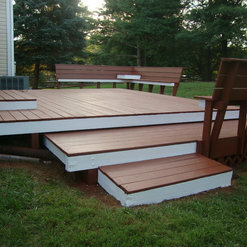 •Increase the lifespan of your deck by 10 years!!! •3 YEAR OF CUSTOMER SERVICE! Nice job on our deck renovation. Price was reasonable and work was timely done once it got scheduled. Email responses were fast. It was our pleasure having business with you. Deck Armor did an excellent job on my deck. I was about to replace all the wood with Trex but they came out with a better and much cheaper option. Spent 5 times less than I was expected before.Now I have the same smooth finishing , no cracks, no splinters. Would hire them again. 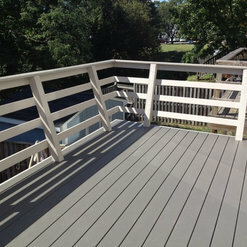 I was very stressed about my deck restoration, as it was a huge job on top of a lot of money. Jim made me feel at ease and was extremely professional and helpful. Super happy with my choice and his work. Will definitely be using deck armor again in the future and referring to friends and family. We were very nervous about the deck project for our new home. Those concerns quickly disappeared once we decided to use Deck-Armor. This is our third home and we have done home improvement projects of various sizes (windows, decks, additions, etc.) on each. I wish we had discovered Deck-Armor years ago for our deck projects. In short, they were awesome! In particular, we love the new deck. 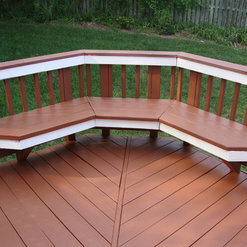 Going forward, Deck-Armor will be getting all of our home deck improvement/remodeling business. Mostly the boards were damaged, so they had to be replaced and after many years the deck could use some cleaning as well. They offer different packages. We discussed which packages would cover all the needs. In overall the service was good and professional. The employees are knowledgeable and they did quality work. Thanks guys, it looks awesome again!! Recently had our deck washed and treated and a railing replaced. We were very pleased with the entire process. We would definitely use them again. I used their services. They were great and very responsive to issues and problems. I'd highly recommend them, they did an outstanding job. Jim the owner, though very busy is very responsive. His workers are hard working and dedicated to doing a great job. Totally please with their work. 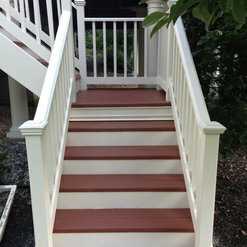 We have a large deck, we had semi transparent stain; which required two coats. Cost was 2500.00, outstanding. 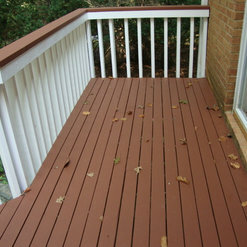 I have spoken to many deck restoration companies, but either reviews were bad or the prices were unreasonably high. 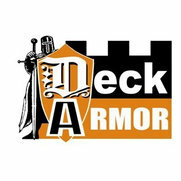 My neighbor told me about Deck Armor LLC( he used them for his deck). 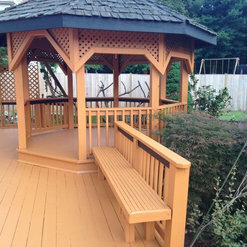 I stop y at his house and was astonished by the look of his new/repaired deck. I called the company for a free quote and got a free estimate on the next day. Was happy with the price and payment options. I paid 30% AFTER they finished power wash, 20% AFTER carpentry and the rest AFTER the job was done. Before the finale payment I walked through with the manager and checked the deck. I was so happy by the look of my deck after all. Great company, fair prices , good job guys.